Dahlias are sub-tropical flowers indigenous to Mexico and parts of Central America. The secret to successfully growing this plant with its showy blossoms lies underground, in the dahlia tubers. 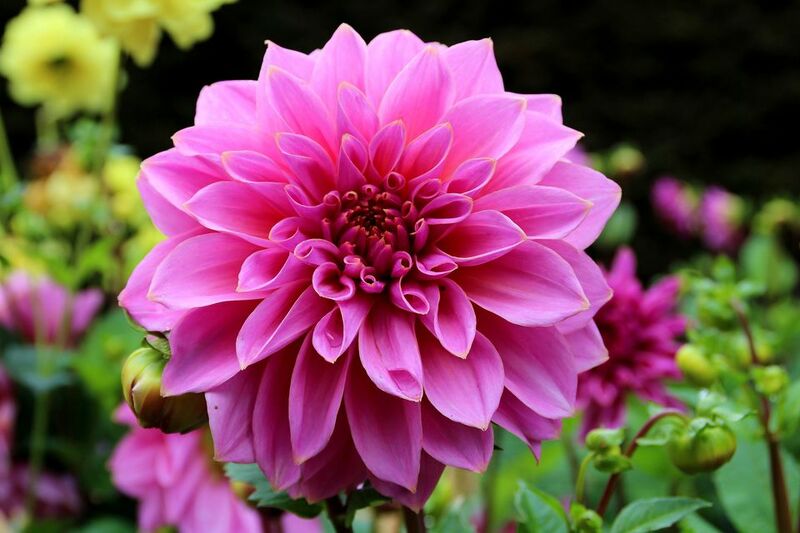 Dahlia tubers are sometimes referred to as "bulbs," although they are not true bulbs; nor are they "corms"—another term that you will sometimes encounter. Hardy only as far north as USDA plant hardiness zone 9 (or, at best, 8), in cold climates the tubers must be dug up and stored for winter. Knowing the right time to dig up your dahlia tubers isn't hard ​because Mother Nature herself lets you know in no uncertain terms. When the first light frosts of autumn arrive, the leaves on your dahlias will turn brown. But do not worry, only the flowers and aboveground vegetation have been killed. The dahlia tubers are still alive underground waiting for you to dig them up and store them away until warmer weather returns. Don't be too hasty about digging them up. Frost stimulates the dahlia bulbs to begin setting eyes for next year (similar to the eyes on potatoes ). Upon the arrival of light frost, your bulbs start working on their plan for next year's growth. So hold off on digging until a week or two has passed. The exception to this rule is if you hear a hard freeze is on the way. A penetrating freeze will damage the bulbs, so in this case, dig them early and hope for the best next year. You can dig up dahlia tubers with a garden fork (a chunky version of a pitchfork) or a standard shovel. Be careful not to let the tool come into contact with the tuberous roots, which are easily damaged. Loosen the soil around the dahlia tubers by thrusting the fork or shovel into the ground about one foot around the perimeter of the plant, gingerly prying up the soil as you go. Plunge the fork or shovel in at an angle into the soil underneath the clump of dahlia tubers, then pry up to free the tubers from the earth. With one hand on the stem and the other scooping the clump of tubers, carefully remove the entire clump from the ground. Poke around the edges of the clump gently with a pencil to knock most of the dirt, feeling for tubers with your free hand. Trim off most of the aboveground vegetation that was killed by the frost, using pruners, but leave a little bit of the foliage in place for now. Gently wash the dirt off your dahlia tubers by swishing them around in a tub of water (or, if you prefer, you can mist them with a garden hose). 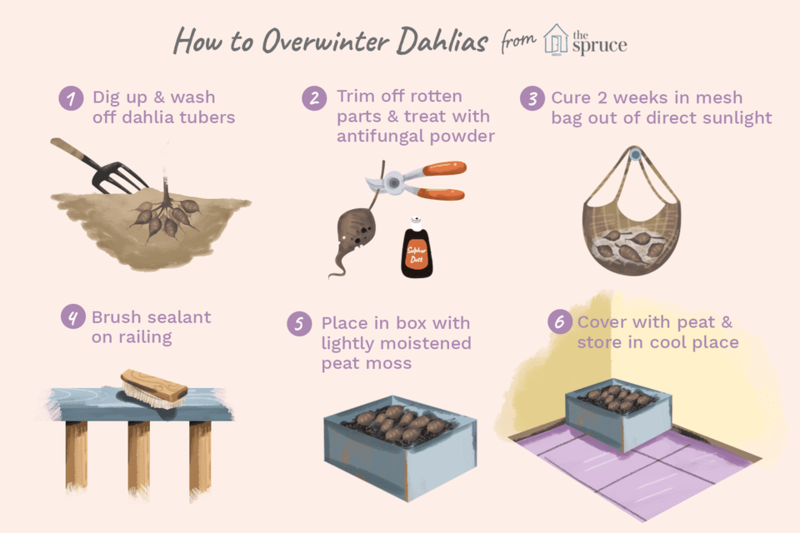 Be very gentle in this operation because even the slightest puncturing of the skin can introduce pathogens that can cause your dahlia bulbs to rot in storage during the winter. Inspect your dahlia tubers, and trim away any parts that are rotten. Also remove the so-called "mother" tuber; in the case of first-year plants, this will be the original tuber that you bought and planted. This older tuber is more likely to rot than the new ones, and such rotting could spread to the others. Let the tubers to dry a bit, in hopes that the wounds will callous over. Protect yourself from sulfur dust by wearing long pants and a long-sleeved shirt, a face mask, and gloves. Sprinkle the tubers liberally with sulfur dust or other antifungal powder to help prevent the spread of the rotting. Also apply the powder to any other area of the dahlia tuber that is nicked or cut, or where you detect signs of injury. Before you dry the tubers for storage, you may decide to divide them now or wait until spring to divide them. When dividing them, each division should have at least one eye because only tubers with eyes will produce new dahlia plants in spring. However, sometimes eyes don't appear until after the winter storage period, so it can be more time-efficient to wait until spring to divide them. The next step is drying or "curing" your dahlia tubers in preparation for storing. Typically, you should dry them for a couple of weeks. If temperatures will not be dipping below freezing and if no rain is in the forecast, it is fine to dry them outdoors, where air circulation can promote drying. Otherwise, dry them indoors. Indoors or out, choose a location where they will not receive direct sunlight; the idea is to air-dry them, not to cook them. Hang the tubers upside down so that any residual moisture in the stem can drain off. You can hang them directly or place them in a mesh bag. Once the dahlia tubers are dried, cut off any remaining stem with pruners. Moisten the peat moss lightly, using a spray bottle, if your storage area is so dry that the dahlia tubers might dry out. Lightly moisten the peat moss; you do not want soggy peat moss, which will actually encourage rot. The battle you face in winter storage of dahlias is keeping a balance between dry and wet. Err on the side of dry. Lay the tubers onto the peat moss in the box and cover them with another layer of peat moss. If you divided the tubers, make sure they are not touching (if one succumbs to fungus, there is no point in having it spread to the others). Store the box in a dark area, such as a basement or cellar, that will remain cool for the winter but will not freeze. The ideal storage temperature is above freezing but below 50 F.
Be prepared to experiment a little with preparation and storage methods until you hit upon the system that works best for you. Some people wrap their dahlia tubers in the newspaper before storing them in the box filled with peat moss. Others store them in paper bags. To facilitate the disinfecting process, add some peat moss to a zipper bag, and place the dried tubers into the bag. Add a liberal sprinkling of sulfur dust. Seal the bag, then gently shake it around to distribute the dust. You want to move the sulfur dust around, not the tubers. Remove the tubers gently from the bag. They are now ready to be stored in the box filled with peat moss. Label the dahlia tubers so that you will know what specific cultivars you are working with when next spring rolls around. If you have lots of clumps to store, consider using separate boxes, or make sure to properly label each clump. Periodically check the dahlia tubers during the winter. If they seem overly dry, spritz the peat moss again with the spray bottle. On the other hand, if a dahlia tuber feels mushy when you check it, it has rotted and should be discarded. Regardless of whether you live in zone 5, 6, or 7, there is a simple way to remember when to plant dahlia bulbs: plant after danger of frost has passed in your area. If you do not know when that is in your region, ask an experienced gardener or check with your local county extension or a good garden center. In zone 5, for example, you might take the appearance of Memorial Day decoration as your cue to plant dahlias.